Seeley Lake, Mt. – I came here to visit a tree named Gus. I figured soon it might be too late. Wherever I travel, I try to keep an eye out for remarkable trees. Gus fit the bill. He is the largest Western larch tree in the U.S. He’s at least 1,000 years old. And I found, when I looked up his location, that he is also in the path of one of the dozens of wildfires lighting up the Northern Rockies and the Pacific Northwest. It’s been another terrible season for wildfires. A long-running drought has left forests and grasslands vulnerable to lightning strikes and human carelessness. The weather has been hot and dry, the air unhealthy. The fire risk is so high that campfires have been banned all across Montana. Here in Montana, the Big Sky has been full of smoke. Even on clear days, the mountains are shrouded in a gray haze. Dozens of small fires add to the murk, but most of the smoke is coming from huge fires still burning in British Columbia. No northern border wall can keep out the unwelcome Canadian smoke. A couple of days into my visit, I developed a smoker’s hack I can’t seem to kick. In Seeley Lake, the threat is closer. The Rice Ridge fire has been burning for two weeks just a few miles above the town. Firefighting teams have taken over the local elementary school, their tents pitched on the ballfield. The lake has been closed to boaters, lest they get in the way of helicopters scooping up water to dump on the fire. Tourists have fled. But Gus is still here, and was surprisingly easy to find. 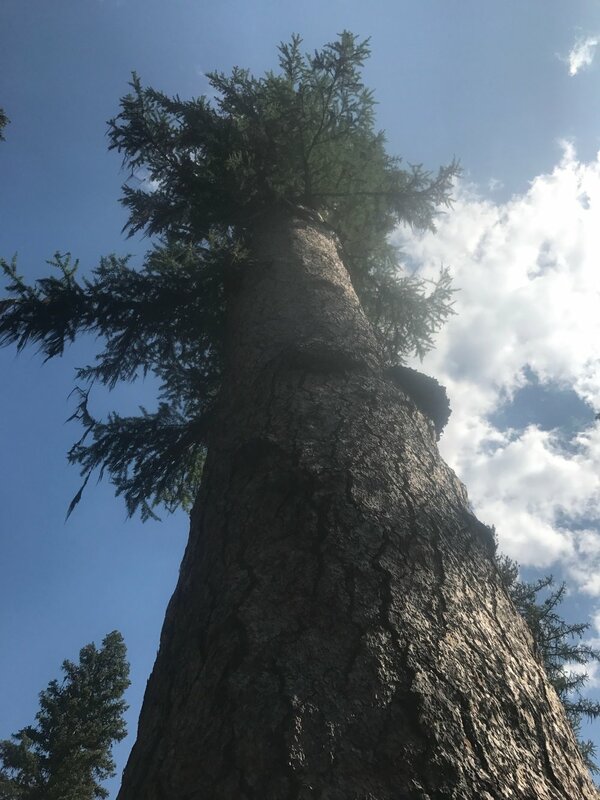 He’s 173 feet tall, 23 feet around, the biggest in a grove of mature tamaracks. Tamaracks are stately trees that grow tall and straight as an arrow. Their needles look like those of a fir or pine, but they turn a deep gold in the fall before dropping, making the larch deciduous. Tamaracks don’t flourish in shade, which is why they grow so tall, with their needles concentrated at the top, above other trees competing for sunlight. If trees worried, Gus wouldn’t have to worry much about the Rice Ridge fire, it turns out. For one thing, it’s on the other side of the lake. More to the point, wildfires help larch trees. Their most important branches are out of reach of the flames. Wildfires destroy the trees that are the larches’ competitors, leaving sunny spaces on the forest floor where young larches can gain a foothold. To protect the health of the tamarack grove in which Gus stands, the Forest Service cleared out competing trees and did a controlled burn of the area in 2003. But the people of Seeley Lake do worry. If the Rice Ridge fire turns toward the town, they could lose everything. Even if their homes and businesses survive, their lungs have already taken a hit. State health officials warn that the air is harmful, that indoors air is just as bad as outdoors air, that air conditioning helps only a little and surgical masks not at all. Their advice: Get out of Seeley Lake. At a public meeting in the elementary school gym, leaders of the fight against the Rice Ridge fire explained that they are “managing” the fire, protecting homes and businesses in Seeley Lake by pushing the fire east, into the Bob Marshall Wilderness, where it can “just do what the Lord wants it to do” without harm to people or property. For its first century, the U.S. Forest Service only thought about putting wildfires out. But successfully suppressing fires just causes dead vegetation to pile up on the forest floor, making naturally-occurring fires larger and more dangerous when they finally hit. Those forestry policies had something to do with the sharp increase in wildfires in the last few decades. The average number of wildfires over 1,000 acres has more than tripled since the 1970s. But climate change is a culprit as well. Droughts and hotter temperatures turn vegetation into kindling. Decreased snowmelt means the wildfire season starts earlier and lasts longer. Warming expands the range of insects that kill some tree species – including the larch beetle, which is exploding in northern tamarack groves – making more fuel for wildfires. That’s why wildfires are raging this summer across northern Canada, northern Europe, Greenland and Siberia, places far from U.S. Forest Service jurisdiction.